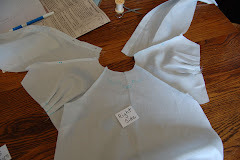 Today we will sew the Entredeux to our Daygown Sleeves and the Neck edge. You will find the instructions for the Old Fashioned Method of Attaching Entredeux to Fabric in your instruction guide on page one, under the heading Sewing Techniques. Read them. Read all the instructions in this Lesson Four post before beginning to stitch. PS. You can have your tea first if you want to! Stitch the entredeux to the sleeve first. Entredeux pinned to sleeve, right sides together and raw edges even. Cut the Entredeux to fit the sleeve edge. This should be about 8". Do not cut larger than 8". If your sleeve is wider than 8", stitch a thread 1/8" from the raw edge of the sleeve and pull up the thread to ease the fabric to fit the 8" of entredeux. The difference between easing and gathering is that easing pulls the fabric up slightly without gathers forming. You will go to Attaching Entredeux the Old Fashioned Method for more detailed instruction. Stitch the entredeux to Neck Edge. Read the instructions about your neck edge in your Pattern Instruction Guide. Look in View 2, Step 4. Then go to the Lesson about Attaching Entredeux. Your thread will frequently run out before you finish stitching. 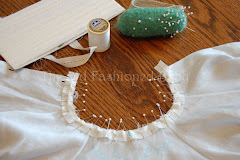 When stitching entredeux to fabric, you can usually hide a knot behind the entredeux. 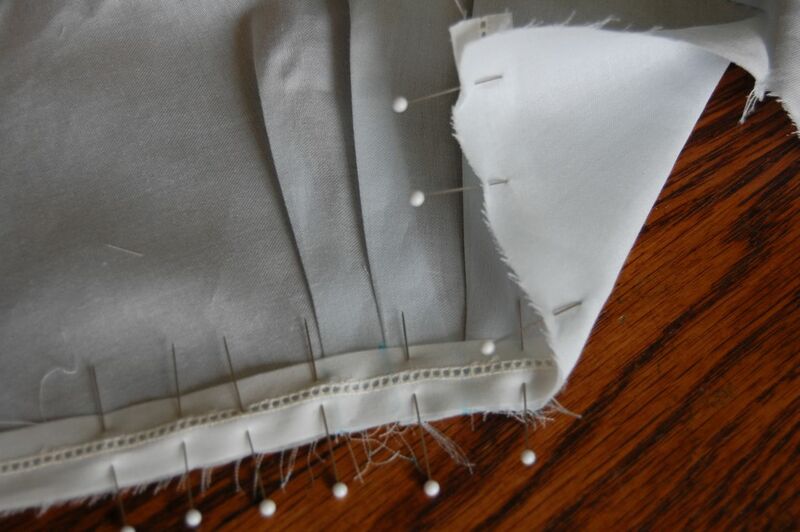 But when stitching a seam, there is no place to attach or hide a knot. Click on Knot for information. Question for Lesson 3: How many years have you been sewing? Pretty yellow Roses are from my garden. We are having tea in my garden today! 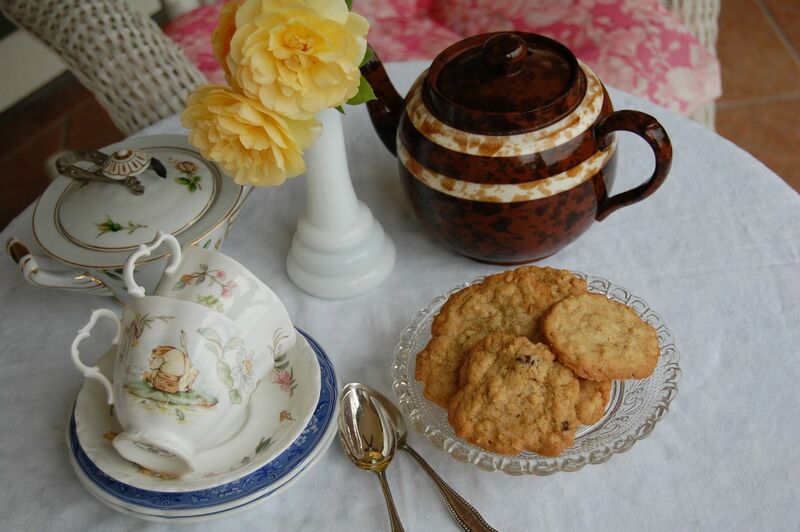 Oatmeal Crisp cookies, and Lady Grey tea. My Brown Betty teapot was carried home to me all the way from England by my sweet Mother In Law. Don't you love the name..."Brown Betty"? "Won't you come into my garden? I would like my roses to meet you!" I have been sewing for 20 years! I started sewing after my daughter was born, and I still use my beloved Bernina 1230! Thank you for the beautiful posts and lovely tea. Yikes! I counted it up and I've been sewing about 50 years... I started when I was about 6. Good morning Jeannie, I'm so excited about this lesson. I love entredeux and can't wait to do this lesson. 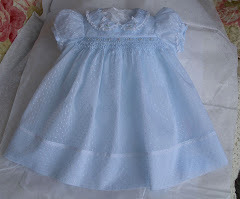 I started smocking and handsewing about 33 years ago for my daughter and then for my son. Back then little girls loved to wear handsewn and smocked dresses all the time. Now I have picked it back up for my grandchildren. I prefer handwork to the sewing machine. The tea and cookies are delicious!!!! The tea cups are precious. 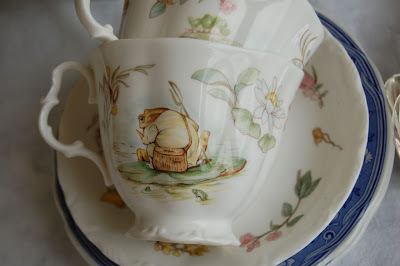 Perfect for having tea and making a beautiful daygown!!! This will be fun. Entredoux just makes an heirloom garment. 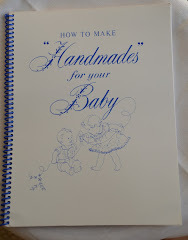 I first started sewing in 1971 - maternity clothes and nursery curtains. I'm not even going to add up how many years. Heirloom sewing and smocking only in the past 10 years. Thanks so much for the wonderful pictures and instructions. Good morning, Jeannie! Some of my favorite childhood memories include sewing with the guidance of my mom, my grandma or our 4-H leaders. I started sewing when I was about 10 years old. (Yikes!! That was 32 years ago!!!) I am trying to pass the same love of sewing and precious memories on to my daughter! I sewed for about 10 years before taking a long break for college, law school and work. I resumed sewing about 10 years ago when my daughter was pregnant with her second daughter and mentioned she wished I had saved some of the clothes I made for her so her daughters could wear them. Thanks for the know lesson. The cookies look delicious! I have been sewing since I was 10. 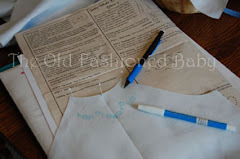 I taught myself to smock with pick-up dots on an old Vogue pattern at that time. I started FHS at 16 (with a daygown!). You have really inspired me with your blog and all your beautiful pictures. I used to avoid hand work because it takes more time, but I have to tell you that I've enjoyed this hand sewing sew-along very much and definitely want to do more. It has been wonderful sitting on the porch hand sewing while my baby sleeps. Thank you! I started sewing at about the age of 5. My mother and grandmother were both excellent seamstress, among may other talents, tatting, embroidery, knitting, etc. So I've been sewing off and on for the last 53 years! Thank you so much for sharing your vast knowledge with us. I have been sewing for 30 years. I have struggled to understand fit and am enjoying this sew a long. I do have a question regarding the lace. Do we pre treat the laces in any way? 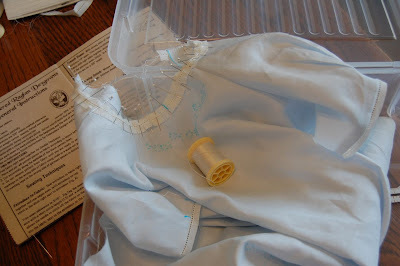 Thank you so much for doing this sew along, I have and am learning an incredible amount. I have been sewing since I was 12. I grew up watching my mom sew and now my daughter is learning. The first thing I ever made was a wrap around skirt for 4H in the 6th grade. When my daughters were young I made 75% of their clothes. I would sew for friends and make hairbows to have money to buy fabric. I have been only sewing for a year and a half. I started sewing when I was in grade school. I am very interested in most forms of sewing, embroidery, etc. Even though I am doing a lot of my gown by machine, I am doing some of the work by hand. Facings, attaching entredeux etc will all have handwork that will show. I've been quilting and sewing for about 15 years. Hi! I've been doing handwork of different kinds since I was about 8. I started sewing clothing on a sewing machine when I was 22. I guess if you count the handwork, I've been using needle and thread for 49 years. Goodness! Hi Jeannie: I started sewing when I was 13. My mother & 2 grandmothers sewed and I wanted to learn. My mother took me to sewing classes at Sears. My mother's sewing machine was an old Singer that only did a straight stitch, no zig zag or buttonholes, so I got discouraged and didn't sew much until my youngest daughter was born 17 years ago - and the bug really hit me hard! I've been sewing non-stop since then and love it so much! My first grandbaby is due Dec 21 so I'll never quit! 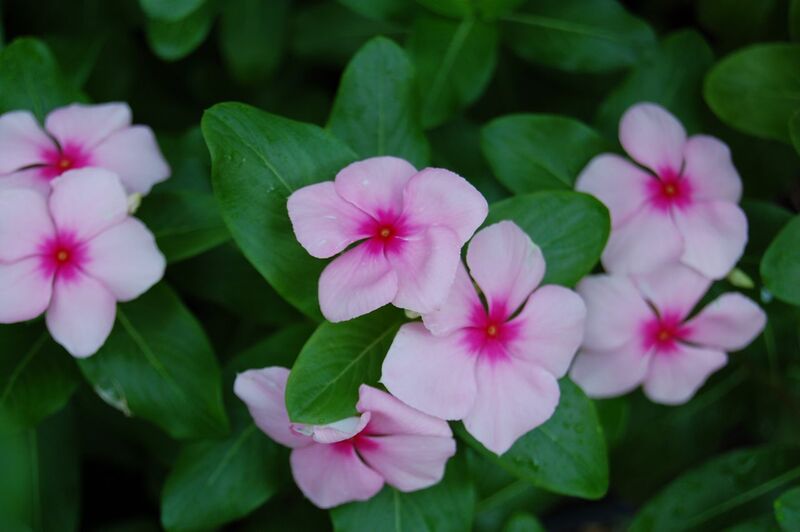 Jeannie, I so enjoy having tea with you each week...and I'm so glad I got to meet your flowers. I started sewing when my daughter was born - 2 1/2 years ago. 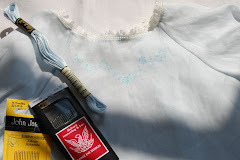 I wanted to smock for her like my mother had for me and that led to sewing (apparently you have to put the garment together after you've smocked it!). And I love your teacups. Mr. Jeremy Fisher is my son's favorite book right now. Thanks for our tea, Jeannie. I started hand sewing when I was around 4, got my first sewing machine and took my first class when I was 9 ( made a suit) . I started heirloom sewing when my oldest was born because we were both in college and couldn't afford clothes for her. I now teach sewing classes to anyone that is interested. So, I've been sewing for around 32 years now. 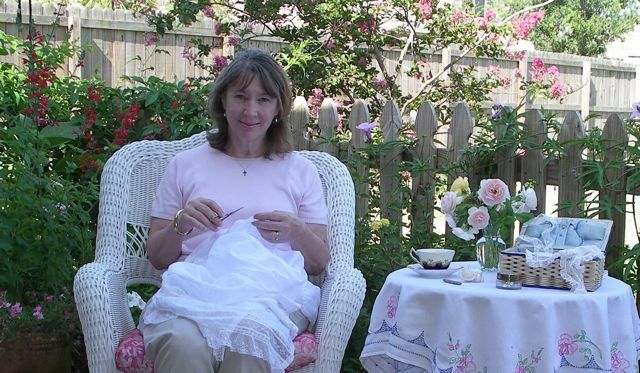 I began with a needle and thread when I was 5, sitting only a few feet from my mother as she stitched away on my clothes. (That was 55 yrs ago). I made a C in sewing in Home Ec because the teacher hated sewing and her instructions were awful. I wouldn't stick to her rules. Another friend and I had mothers who could sew circles around the teacher. Besides children's clothing, tailoring has been the most rewarding type of sewing that I have done over the yrs. Thank you for such inspiring lessons. I started learning to sew about 28 years ago when my daughter was born. Unfortunately, I had very little time to devote to it and didn't do much. About 6 years ago I went to a Martha Pullen School of Art Fashion and saw the beautiful work of the teachers and other students (I live in the Midwest where you don't see much heirloom sewing). I make more time to sew now and only hope I'll have grandchildren one day to wear the things I'm making. I learned to sew in high school, but not the correct way. No seams were finished. 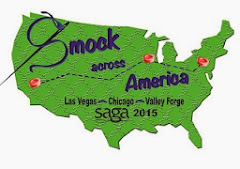 I learned to smock 2 years ago, and began heirloom sewing. I learned so I could put up clothes in my grandmother hope chest. I have 7 grandnieces and nephews that have been my guinea pigs, and I found I have a true passion for sewing children's clothing. This is my 1st completely by hand, and I'm thoroughly enjoying it. Thank you for sharing your expertise, it's great to learn from the best!! Got my pattern in the mail the other day. Thought I could purchase it locally and that was not the case. Fabric is in the dryer and I have frantically been reading all the lessons so they will sort of be in my head and I can catch up this week. Have been sewing for over 50 years so I think I can manage to catch up. My grandmother taught me to sew. She was a very accomplished seamstress and taught me how to do things correctly. Like some of the others I did not do well in Home Ec sewing and always felt the teacher just didn't like the idea that I had sewn for so many years and was way above making a peter pan blouse and a box pleated skirt. She and I didn't always agree on how things should be done. i just like doing heirloom baby things now. Don't have any grandchildren young enough anymore but still like to do the sewing. It's a hobby I still share with a friend from elementary school. We get together and attend classes together when we can. We will see Jeannie at SAGA next month. First time we have attended SAGA. I took a Home Ec class in the 7th grade and started my "formal" sewing education. Started long before that since my grandmother was a seamstress and let me "help" in her sewing room. Since I'm a very senior citizen, I've been sewing many, many years. Where do you get a fabric board? I've decided I need one!!! I'm loving this lesson with extredeux. Gown is coming together!!! Entredeux is attached witha running stitch only. You don't whip on by going into each hole? Answer to Sherry: There are different kinds of Lace Boards (I think that is what you mean) and you might look at a fabric or craft store for them. We are attaching the entredex with a running stitch only. Click on the picture to see if it gives you a close up of the stitching. You do not go into the hole of the entredeux. Just attached the entredeux to the first sleeve and press. Looks wonderful. Thanks --Learn something new everyday!!! I just attached the entredeux to the neckline. My question is what happens to the 1/4 inch of entredeux that extends beyond the neckline? Is there a special way to deal with this that I missed? Thank you so much for this sew along. Answer to Jerome: It will be turned under after the lace edging is attached. We will do that later! Jeannie....I taught myself to sew on my mother's old Singer when I was about 6 years old. I made Barbie doll clothes. So I guess I've been machine sewing for almost 36 years now. I taught myself to embroider, cross stitch, and tat around the age of 10. I have always loved hand work!!! I sewed my toy a dress on a sewing machine when I was about 5 YO and stopped. I started it up again 12 years ago and this year I'm just now learning how to handsew...I love it so much! Thank you for this great chance to learn more. Hi, Everyone! 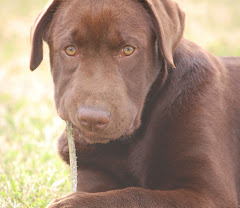 I am loving this sweet project & getting to know a bit about our little group! My sewing began with cross-stitching pre-stamped tea towels with my Grandma Florence at age 5 or so. If things become vintage at age 50, then those tea towels & I are certainly vintage! My 'real' sewing began in earnest at 11 with lessons at the Singer store downtown Des Moines ~ my first project was a wool blazer ~ I have always loved a challenge! Thanks for another lovely tea, Jeannie! I have been sewing on and off for about 20 years, mainly quilting. 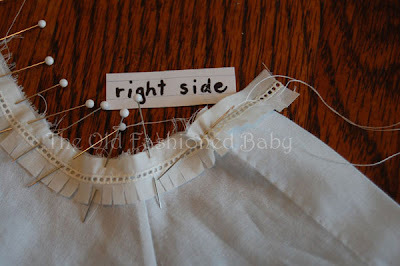 I love smocking and heirloom sewing and do apprciate this blog. I have a question...does it matter what side the buttonholes are on...left back or right back???? Thanks. Answer to Suzanne: Funny you should ask! Years ago, I was doing serious research on just that topic. But can't go into all that here. No , it doesn't matter. I usually put the button holes on the right (as if you are looking at the garment) side because it is easier for a right handed person to button them. But if you look at my pattern drawings and my garments I am not really consistent. Someday I will do a post of this. It's kinda interesting. I have been hand sewing since 3rd grade so...nearly 7 years...I only started machine sewing recently. You dishes are so cute!!! Oh dear, I am running a little behind in this lesson. Should be back on track after the next weekend! Well I am not sure how many years I have been sewing, but I have been doing Fine Hand Sewing (off and on) since 1997 when I attended a SAGA regional convention that was in Anaheim, California. I had two wonderful classes with you - an entirely hand stitched bonnet and an embroidered pillowslip. It was my first exposure to this art form - and I was so totally hooked that I made two of each! I am thoroughly enjoying this stitch along...thank you so much! I,ve been sewing for 60 years. 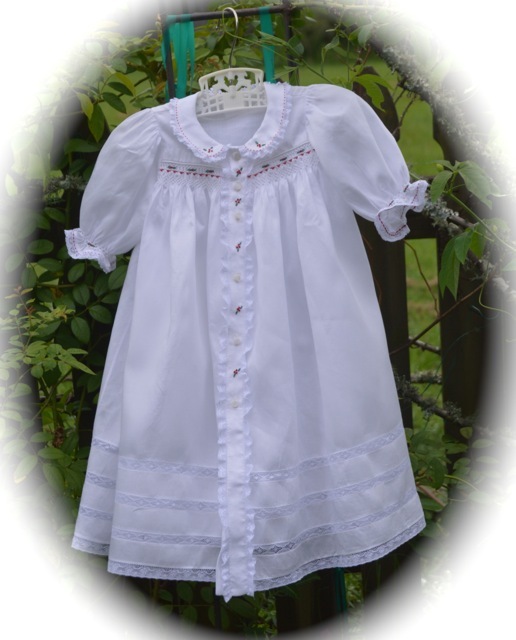 Started heirloom sewing 8years ago tomake smocked clothes for my grandaughters. They ate 9 and 11 now and not interested in smocked dresses anymore so I sew for gifts or my own pleasure now. My mother is an excellent seamstress so I was exposed to fine sewing and tailoring all my life. However, at that time mother did no sewing for babies or children. 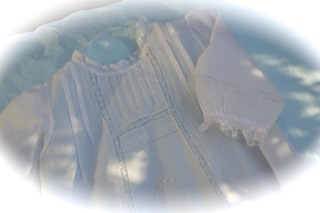 When I married and had my own children I learned to smock and sew for them. I took French hand sewing lessons, went to several of the very first Martha Pullen schools (remember lugging your machine up and down those stairs?!?). My favorite type of sewing is for babies and children. Although last week I did honor a request from my youngest son who is still in college. I made him a tailored man's shirt in LSU motif fabric. He requested one for "game days". So I have been doing this type of sewing for about 32 years. And now I have the pleasure of sewing for my grandchildren!! My daughter now sews for her children also. Sewing is a really great hobby that we share together. We are always planning the next project for her toddler daughter and new baby son. I am like Darby, I machine sew on my old Bernina 1230. It is my favorite machine and still runs great. Thank you once again Jeannie for the classes and the lovely tea at the end. Will you share any of your recipes? After missing the first 2 lessons, I have completely caught up and loving the hand sewing. Thank you so much Jeannie for the lessons and the wonderful tea at the end. After missing the first 2 lessons, I am now completely caught up. I love the hand sewing. Last time I asked about putting tucks in my sleeve since I was substituting the Priscilla pattern(I put the opening down the back). I ended up using four tucks and the size turned out exactly right for the pattern measurement. I really liked the look of the tucks. I have been sewing since I was old enough to stick a dull needle through whatever fabric scrap my mother was willing to give me. I remember "helping" her make clothes for my Barbies. She must have had the patience of a saint - I can't imagine doing Barbie clothes under any circumstances, never mind with a helper like I must have been. I miss her but sewing always makes me feel like she is there beside me again. 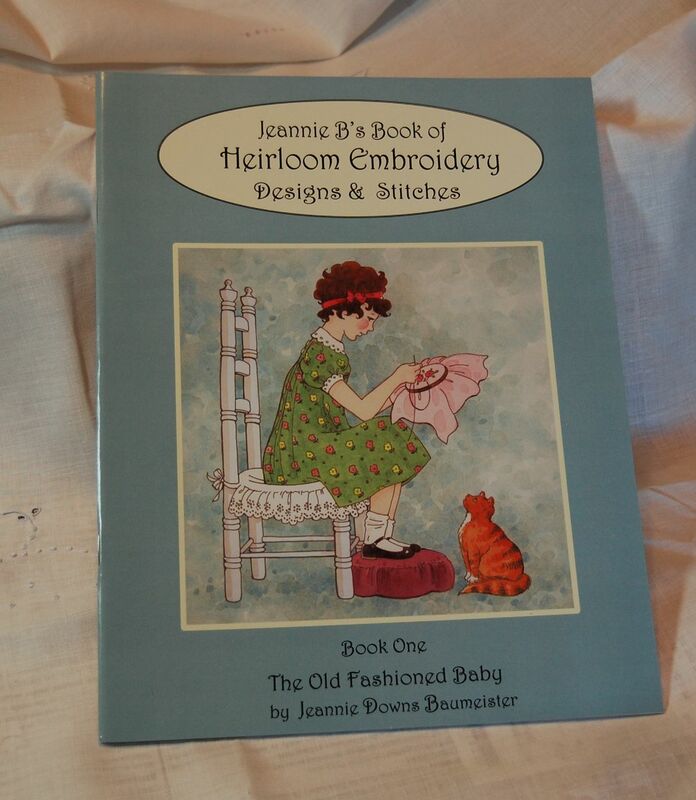 Jeannie-Thank you for this sew along. I am now caught up :-) The Lady Gray Tea hit the spot-it is my favorite! I have been sewing over 40 years-I was inspired by my mother who sewed for me and I had many happy hours stitching up scraps into clothes for my dolls. I got started on the project late, so I'm scrambling to catch up both on comments and on the stitching!I'm stitching along for fun and to practice hand sewing. I live in SE Kansas. My sewing room is in the attic; It's still a work in progress, but quite cozy, and filled with things I love. But I would love to have a "real" floor and more storage! 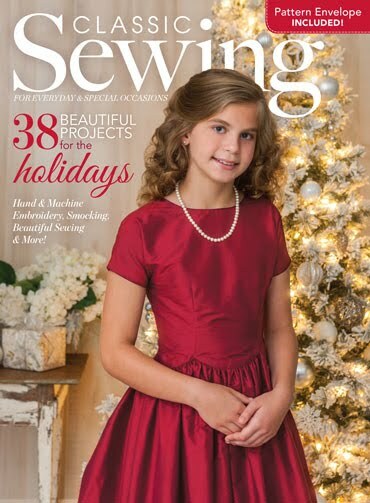 I've been sewing since I was 4 (over 50 years! )but more seriously just for the past 11years.